The NFC Championship game on January 18, 2009 featured two teams that had won fewer than ten games during the regular season and were hardly expected to get so far. 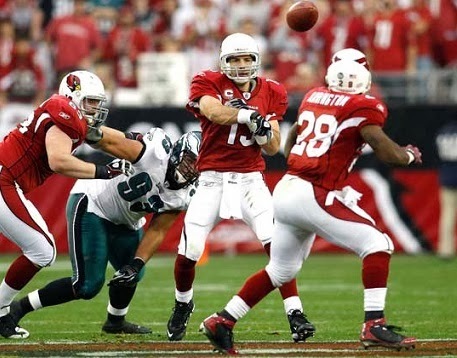 The Arizona Cardinals, winners of the mediocre NFC West with a 9-7 record, which made them the fourth-seeded team in the conference, hosted the Philadelphia Eagles, who were the sixth-seeded team after finishing second in the NFC East and qualifying as a Wild Card at 9-6-1. Under Head Coach Ken Whisenhunt, the Cardinals were a pass-oriented team on offense with QB Kurt Warner (pictured above) throwing to wide receivers Larry Fitzgerald, Anquan Boldin, and Steve Breaston, all three of whom reached a thousand receiving yards. RB Edgerrin James, once an outstanding runner with the Colts, was on the downside at age 30. The defense was suspect and ranked 28th in points allowed. The Cards had been long-time underachievers and, after getting off to a 7-3 start, seemed to revert to form as they lost four of their last six games. Some of those defeats had been by lopsided scores, including a 48-20 blowout at the hands of the Eagles when they met on Thanksgiving night in Philadelphia. However, with expectations low as the postseason commenced, Arizona defeated the Falcons in the Wild Card round and then dominated the 12-4 Panthers on the road at the Divisional level to advance to the NFC title game. The Eagles, under Head Coach Andy Reid, had been inconsistent and were 5-5-1 after being routed by the Ravens before winning four of five to make it into the playoffs. QB Donovan McNabb passed for a career-high 3916 yards, but was benched during the second half of the loss to Baltimore and not as much the running threat he had been in his early years. RB Brian Westbrook was an outstanding all-purpose back and rookie WR DeSean Jackson was developing into a big-play receiver. The heart of the defense was still FS Brian Dawkins, who had been joined in the backfield by Pro Bowl CB Asante Samuel. Philadelphia defeated the Vikings in the Wild Card round and then the top-seeded Giants at the Meadowlands and was back in the conference championship game for the fifth time under Coach Reid. There were 70,650 fans present at University of Phoenix Stadium in Glendale, AZ. While the weather was pleasant, the stadium’s retractable roof was closed in order to amplify the sound of the partisan crowd. The Cardinals took the opening kickoff and drove 79 yards in nine plays. Kurt Warner completed his first three passes, two of them to Anquan Boldin for a total of 16 yards and one to Larry Fitzgerald (pictured at right) for 19. Edgerrin James then ran three straight times, the last two for 16 and 12 yards to the Philadelphia 12 yard line. A short gain by RB Tim Hightower was followed by a Warner throw to Fitzgerald for a nine-yard touchdown. Neil Rackers added the extra point and Arizona had the early 7-0 lead. The Eagles came right back with a long drive of their own that covered 33 yards in eight plays. Starting at their own 40 after Rackers kicked off out of bounds, Donovan McNabb scrambled for 21 yards to the Arizona 39. Short passes by McNabb interspersed with carries by Brian Westbrook got the ball to the 22, but with the crowd roaring, a five-yard penalty for a false start backed the Eagles up five yards to force third-and-nine and, after McNabb threw an incomplete pass, David Akers kicked a 45-yard field goal. The Cards went three-and-out on their next series and the Eagles, following the punt, regained possession at their 33. Facing third-and-10 after two incomplete passes, McNabb’s next throw was intercepted by FS Aaron Francisco, but he fumbled at the end of a 27-yard return and OT Jon Runyan recovered for Philadelphia. Given a reprieve, the Eagles moved into Arizona territory as McNabb threw to WR Hank Baskett for 14 yards, Westbrook had a 14-yard run, and RB Correll Buckhalter carried twice for 12 yards to the Arizona 35. Now into the second quarter, the drive finally stalled at the 29, but this time Akers was wide on a 47-yard field goal try and the visitors came up empty. On the next play, Warner went long for Fitzgerald on a flea-flicker and it was good for a 62-yard touchdown. Rackers added the extra point for a 14-3 lead. Philadelphia came back with a seven-play, 65-yard series. A third down sack was negated by defensive holding and McNabb then threw to WR Kevin Curtis for a 47-yard gain to the Arizona 19. Once again, the visitors couldn’t reach the end zone, but this time Akers was successful on a field goal attempt from 33 yards. The Cardinals started off their next drive with James running for 22 yards up the middle to his own 49. Warner completed passes to RB J.J. Arrington for 16 yards, TE Leonard Pope for 12, and Steve Breaston for 10 yards, with running plays interspersed, to reach the Philadelphia four. Warner connected with Fitzgerald for a third TD, this time from a yard out as the wide receiver outmaneuvered CB Sheldon Brown in the corner of the end zone. Arizona was ahead by 21-6. 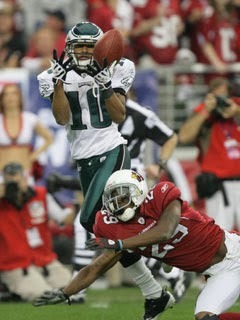 The Eagles had to punt following their next series and the Cards again drove to a score, going 80 yards in nine plays. A Warner pass to Boldin that was initially ruled complete for a 32-yard gain was overturned following a challenge, but the Cardinals managed to overcome a third-and-15 situation as Warner threw complete to WR Jerheme Urban for 18 yards to the Arizona 49. A pass to Fitzgerald picked up 14 yards but DE Trent Cole sacked Warner two plays later and the Cards settled for a 49-yard Rackers field goal. Still, they went into halftime with a commanding 24-6 lead. Philadelphia came out throwing to start the third quarter. McNabb had completions of 20 yards to FB Dan Klecko, 14 yards to WR Jason Avant, and 8 to DeSean Jackson to reach the Arizona 49. But on third down, McNabb fumbled the ball away when sacked and DE Bertrand Berry recovered at the Philadelphia 43. The Cards were unable to move, however, and punted, seemingly pinning the visitors down at their 10 yard line. The Eagles drove 90 yards in 13 plays, converting three third downs along the way. Short passes interspersed with runs by Westbrook got the ball to the Philadelphia 39, but after SS Adrian Wilson sacked McNabb for an eight-yard loss, the Eagles faced a third-and-18 situation. McNabb went deep for Curtis, who made the catch for a 50-yard gain to the Arizona 19. The possession ended with McNabb connecting with TE Brent Celek for a six-yard touchdown and, with Akers adding the PAT, Arizona’s lead was narrowed to 24-13. The Cardinals went three-and-out on their next series, and following the punt the Eagles drove to another score. McNabb threw to Curtis for 14 yards and, on a third-and-six play, tossed to Jackson for nine yards to the Arizona 34. McNabb completed another touchdown pass to Celek, this time covering 31 yards, and while Akers missed the extra point, the Eagles were down by just five points heading into the fourth quarter. Arizona’s seemingly unstoppable offense of the first half was unable to move effectively thus far in the second, and the Cards punted the ball back to the Eagles early in the final period. It took Philadelphia just four plays to score again. Starting at their 14, McNabb threw to Buckhalter for 12 yards and Avant for nine before Westbrook carried for three yards up the middle. McNabb then went long for Jackson, who was covered by CB Dominique Rodgers-Cromartie. The cornerback tipped the ball as he fell down, but Jackson was able to make the catch and proceed to the end zone for a 62-yard TD (pictured above). The Eagles tried for two points, but McNabb’s pass failed. Still, the Eagles were ahead by a score of 25-24 with just under eleven minutes remaining on the clock. Breaston returned the ensuing kickoff 29 yards to his 28 yard line. Warner threw to Fitzgerald for 15 yards and Pope for nine before James lost a yard on a running play. 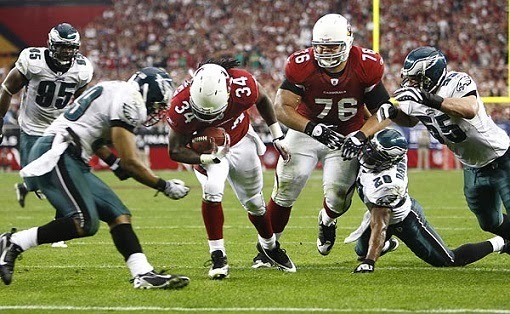 Hightower gained the yard back, but the Cards now faced fourth-and-one at the Philadelphia 49. They converted when Hightower ran for six yards around right end. After a short carry by James, Warner connected with Fitzgerald for 18 yards to the 23. A three-yard run by James was followed by Fitzgerald catching a pass for six yards and, on third-and-one, Hightower came through again with a five-yard carry. Runs by James and Hightower netted a yard and it was third-and-goal at the eight. With his receivers spread out, Warner threw to Hightower out of the backfield for a touchdown. The Cards went for two and converted as Warner connected with TE Ben Patrick, putting Arizona back in front by seven points. Taking over at their 20 with 2:53 remaining, the Eagles drove to the Arizona 47 as McNabb completed three straight passes, the longest to Westbrook for 19 yards. But that was as far as they got. The next four passes fell incomplete and the Cardinals took over on downs, effectively ending the game. Arizona was the winner by a final score of 32-25. The Eagles had the edge in total yards (454 to 369) and first downs (22 to 21). However, Philadelphia also turned the ball over three times, to one suffered by the Cardinals. The Eagles also were penalized seven times, at a cost of 64 yards, to just three flags thrown on Arizona, for 15 yards. Kurt Warner completed 21 of 28 passes for 279 yards and four touchdowns with no interceptions. 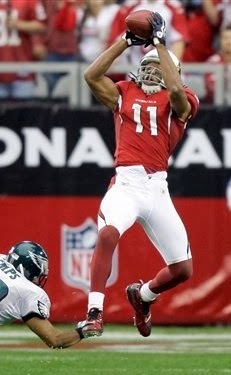 Larry Fitzgerald had 9 catches for 152 yards and three TDs. Edgerrin James ran for 73 yards on 16 carries and Tim Hightower (pictured below) contributed 33 yards on 11 attempts as well as the game-winning touchdown on his lone pass reception. Defensively, Adrian Wilson recorded both of Arizona’s sacks. For the Eagles, Donovan McNabb came on strong in the second half comeback and was successful on 28 of 47 throws for 375 yards and three TDs with one interception. Brent Celek had 10 pass receptions for 83 yards and two touchdowns while Kevin Curtis gained 122 yards on four catches and DeSean Jackson added 6 receptions for 92 yards and a score. Brian Westbrook was the team’s top rusher with 45 yards on 12 carries. The Cardinals went on to lose to the Pittsburgh Steelers in a close Super Bowl battle. They had a 10-6 record in 2009, again topping the NFC West but losing to the Saints in the Divisional playoff round. Philadelphia also had a better record in ’09, going 11-5 and qualifying as a Wild Card after placing second in the NFC East. The Eagles lost to Dallas in the first round.